Please select the best package that describes your situation. For questions on your type of hair loss or for more advanced programs, call 480-222-4247. The Evolution Clinical Laser Treatment is always a better option for maximum results. But to use the Evolution Hair Regrowth System from home is still far superior to using the laser only programs from someone else. 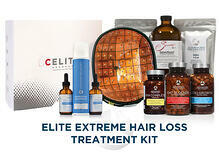 This kit is for women who are just at the begining of their hair loss treatment and no major areas of thinning. The HairStem Plus Kit will provide the essentials for female to help control excessive hair loss, regrow minor areas of hair loss, and help restore a healthy scalp enviroment. 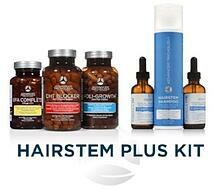 Contains the Complete Hair Growth Nutritional Line and the HairStem Kit. For Women with Diffuse Thinning Hair due to a family history of hair loss and have NOT used birth control pills/IUDs or hormone replacement, this kit will provide topical and internal protection against pattern hair loss. Here, you are receiving the benefits of the Advanced Trichology HairStem 3-part System for Hair Regrowth, the complete Hair Growth Nutritional Supplement Line, and the LC ELITE 80 Diode Laser. This combination of products contains an FDA approved ingredient to treat hair loss and is perfect for the female who wants to promote hair regrowth throughout the entire scalp. For the most dramatic results from a home care program, you need to be using the most powerful products at your disposal. This kit contains the same items as the Extreme Hair Loss Treatment Kit, but adds the Follicle Stimutaing Spray, Conditioner, and Evolution's Hormone Balancing Cream that will increase Progesterone and phyo-estrogens naturally. This kit should only be used by women over the age of 35, or have previously been on birth control pills/IUD or hormone replacement. 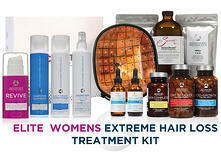 The Women's Extreme Kit is ideal for those women who have a noticable thinning or balding area. To get started with this kit, is to take control of your hair growth again! If you have questions about this kit or any of our products, please call us at 480-222-4247. When you purchase product from Evolution Hair Loss Institute, you become our OutPatient Client. You then have access to us 6 days a week and all of the resources of one of the most advanced Hair Loss Medical Clinics in the USA. Evolution Hair Loss Institute’ primary goal is to heal, educate, and provide individuals suffering from male and female pattern hair loss with a lifestyle and a natural treatment process that will prevent future hair loss and regrow as much natural hair as possible. Our process allows the client to safely treat their hair loss from all angles using a whole body approach without the risk of pain, scarring, or side effects. 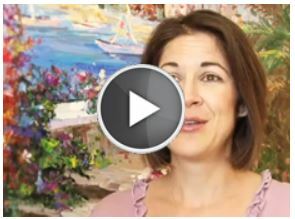 Learn more for our Clients in Video below.